Ergonomic, durable and comfortable. Made with multiple users in mind. Available with several control options, a double curve back rest for additional lumbar support and a new task arm. This is one of my best sellers when you are looking at an ergonomic chair that is specific for heavy usage. 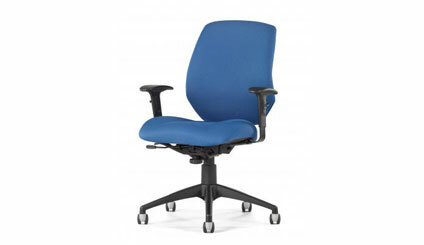 This model is a one size fits all ergonomically engineered task chair. With an attractive linear profile and a contemporary body conforming back, it is everything that you would expect in a chair that is engineered for 24/7 heavy usage. I have put these chairs in fire halls, ambulance stations, hospitals, clinics, military environments and just about everywhere you have a user that sits for a long period of time and requires comfort and adjustability in a chair. The Allseating Chiroform Ultra Task Midback chair is available in various fabrics, with or without arms and carries a 10 year bumper to bumper warranty.